History: Headrests became standard equipment on all cars in the sixties, in part, to support the head when reclining seats are titled back, and in part to reduce the high forces the neck may be allowed experience, as the head tilts back during rear-end collisions, or on the secondary return movement in frontal crashes (causing “whiplash”). See: Adjusting Headrests. Produced for more than a decade, the Amazon and 1800 models spanned this time period, with early cars not being equipped with them, intermediate production years not being equipped, but the frames being ”Headrest-ready” to accept an optional installation kit, and late models being equipped with them as standard equipment. The “Headrest-ready” cars produced in ’67 (from Chassis No 279900 for the North American market, see: Reference Information), were delivered with receiver tubes in place on the internal Seatback frame, but no Headrests fitted. These receiver tubes allowed for a simple dealer option installation without having to remove the seat upholstery, by just piercing the vinyl covering the tubes (see Fig. 3 of Accessory Instruction Sheet shown below), adding grommets to clean up the cut edge, and then inserting the downtubes of Headrests into the receiver tubes in the seat. If you are lucky enough to have one of these intermediate vehicles, and you decide on installing Headrests, you will also be spared the additional work of removing the seat upholstery to install the receiving tubes. It can be determined if these tubes are present by carefully feeling around on the top surface of the Seatback (where there is not much padding), in symmetrical locations about a foot apart. On later Amazon models after about ’68, the receiver tubes and Headrests were standard factory equipment. Volvo accessory kit PN XXXXX. These Headrests are obviously a bit different style, with the tubes departing from the side. I have not had one of these kits in my little fingers, but if it would be helpful if someone who does have access to this style can measure the distance between downtubes to verify it is also 11 5/8" (29.5cm). Installing and/or Retrofitting Headrests: Three options and an alternate are available to the installer...listed in order of simplicity (not counting the Alternate). Option 1: If you are lucky enough to have ”Headrest-Ready” Seatbacks, procure and install original equipment Headrest kit PN XXXXXX as shown above, if you can get one of these into your hands! Purchase a Lottery Ticket on the same day because you should take advantage of being that lucky, and maybe you can get back part of what the OE kit surely cost! 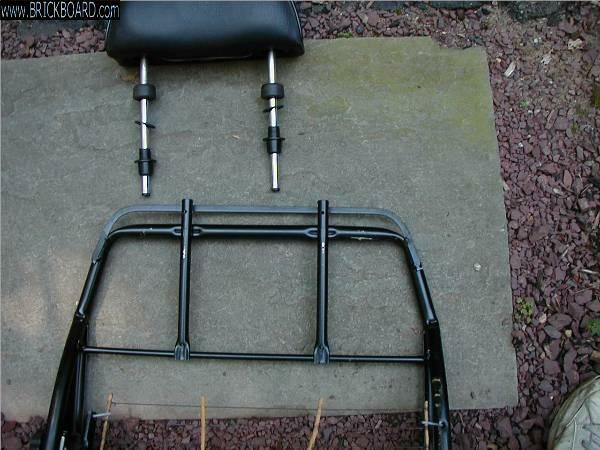 Option 2: Short of getting the entire kit, procure just the original equipment Headrests only, like from a parts donor car. Check uncertain automotive tag-sale-purchases as suitable for your vintage Volvo by verifying the critical 11 5/8" (29.5cm) dimension between downtubes. Color mismatches can be ignored, corrected by reupholstering, or fixed with spray-on ”Vinyl dye” products available (Search for: Spray-on Vinyl Die). A: Install these Headrests onto ”Headrest-ready” Seatbacks, if receiver tubes are present, or B: Install Headrests onto suitably modified Seatbacks, if no receiver tubes are present. See: Making your Seatbacks ”Headrest-Ready” Removal of the Seatback upholstery will be necessary to have the tubes installed by welding as shown below. The early style Headrest with 11 5/8" downtube spacing. Option 3: Construct and install your own Headrests per the drawing below. A: Install onto ”Headrest-ready”, or B: Suitably modified Seatbacks. The drawing should help interested parties make acceptable copies of the original. Alternate: Slip-over-the-top-of-Seatback-type Headrests are an effective and totally non-invasive solution if you decide you must have Headrests, yet still have your heart set on leaving your 122 in absolutely factory original, and unchanged condition. I checked at a couple of suppliers, but couldn’t find this style offered anymore. If the reader can find a source, please drop us an e-mail so that it can be included here. Making your Seatbacks ”Headrest-Ready”: If you are lucky enough to be able to have receiving tubes in your Seatback frames from the factory...great, if not, simple 1/2” ID clearance tubes can be fitted to the Seatback frame by welding as shown on the factory instruction sheet.. Critical is the center to center dimension on the tubes at 11 5/8” (29.5cm)...centered with respect to the Seatback obviously...unless you like to drive around like those guys who look like they have a spinal problem. Lumbar support bands: Since stripping the upholstery from the Seatback is required for this operation, it is a very good idea to check the condition of the lumbar support bands at the same time...these are somewhat protected inside the Seatback, but still susceptible to turning into “sheet pasta gone wrong” [Gordon H.] from age. The Pirelli supplied material is still available [Placeholder for source] for refurbishing the seats, and greasing the threads on the internal adjustment rod is also recommended while there is access. Removal of seat upholstery showing loop in Seatback frame (Green) which locates top of receiver tube. Also visible, more "sheet pasta gone wrong"
Wide spacing Headrests on bare seatframes. Pic source: ? 140 Seatframe with narrow (7 7/8") Headrest spacing. Construction of Reproduction Headrests, suitable for vintage Volvos with the standard 11 5/8" receiving tubes: The frame is based on standard 3/8“ copper pipe, elbows and “T” fittings, which are soldered into the dimensions shown , and covered with foam. Firm, closed cell Urethane foam is used to set the general shape. Cut the foam into a block of the correct dimensions, then in half in order to allow the frame to reside in the fore/aft center. After gluing the two halves onto the frame, in a clamshell manner (with clearance slots cut to accommodate the tubes...not too loose! ), cover with soft 1/4 foam, and finally upholster in the color of your choice...this is a relatively simple construction project for any self-respecting, get-it-done-type, vintage Volvo rigger type guy! From a crash safety standpoint, the (soft) copper is actually good in that it will gently deform, absorbing impact energy, and it is much less likely to break like the steel tubes, leaving sharp ends. If you can locate the infinitely adjustable height-locks, great, if not, you may want to use the 1/2” ID heater hose trick (see below)! Drawing for construction of reproduction Headrests. Hands-on Experience: The Seatbacks of the ’66 Snow Weasel did not have receiver tubes in place from the factory, so these had to be retrofitted by welding into place after removing of the covering upholstery. I removed the upholstery and a local automotive shop did the actual welding. [http://www.volvoadventures.com/index.html ]...my Greetings and Regards, to one of the biggest vintage Volvo fans around... in New Zealand!...isn’t the Internet fantastic?!. Because the simplified receiver tubes which I added had no height-clamp with which to lock the downtubes into place vertically, I simply used 2” lengths of 1/2” ID heater hose over the downtubes, which sit on the plastic receiver tube end caps (these were supplied by the automotive upholstery shop), as a nonadjustable height spacer. These spacers fix the vertical position above the Seatback. This solution is not nearly as elegant as the original chrome plated downtube with the infinitely adjustable locks, but nonetheless totally effective and still a neat looking installation. See: Adjusting Headrests. Headrests themselves were from a donor 140.
but it doesn't really bother me! before any color matching of the vinyl. Thanks to René F. of the Volvoniacs Forum for the picture. Adjusting Headrests: For Headrests to be most useful and offer the best protection, they should be adjusted well. This means that they should support the head and not allow it to tilt way back. I'm amazed how many hits an gurgle search on "Headrest adjustment" turned up...only upwards of 300,000!...it seems that everybody, from auto insurance companies to your friendly neighborhood government safety nannies (the same non-brainiacs who haven't yet felt it necessary to adjust bumper heights of vehicles to standardize them) has information out there telling you how-to. As far as I'm concerned, correct adjustment means setting them to a height where the middle of Headrest contacts and supports the middle of my head when tilted back (and I figured that all out without a two year $3,000,000 study!). Measurement of Headrest Tube OD. Source: Excerpt from Exploded part diagrams. Note Chassis Numbers. Sources of external materials are attributed. Otherwise, this page is Copyright © 2007-2017, Ronald Kwas. The terms Volvo and Pirelli are used for reference only. I have no affiliation with either company, other than to try to keep their products working for me, and to help other enthusiasts to do the same (although there is little chance of preventing "Sheet Pasta gone Wrong"...it just kinda happens with time!). The results and highly opinionated thoughts presented here are from my own experience, and carefully considered opinion, and should be used in conjunction with normal, careful shop practice, or can be ridiculed and laughed at, or worshipped, at your discretion. Remember, you alone are in control of your knuckles, and future! As always, if you can supply additional info to help fill in the blanks, or objective experience, I’d appreciate hearing it, and will consider working it in to the next rewrite of this article...along quite possibly with the odd wise-a** comment, if I can possibly work it in. You are welcome to use the information here in good health, and for your own noncommercial purposes, but if you reprint or otherwise republish this article, you must give credit to the author or link back to the SwEm site as the source. If you don’t, you’re just a lazy, scum sucking plagiarist...and the Boston Globe wants you!